PRODUCT DESCRIPTION: Designed to release over a few weeks, Demand granules use a fast working active highly effective on insect pests which live in the soil. Virtually odorless, Demand works fast on surface insects and will repel ants, beetles, flying pests and help prevent digging by predator animals. TARGET PESTS: Demand is effective on the following but not limited to ants, armyworms, beetles, centipedes, cockroaches, crickets, cutworms, earwigs, firebrats, fleas, grasshoppers, japanese beetles, millipedes, mites, pillbugs, silverfish, spittlebugs, springtails, ticks, waterbugs, billbugs, chinch bugs, dung beetles, june beetle grubs, mole crickets and more. 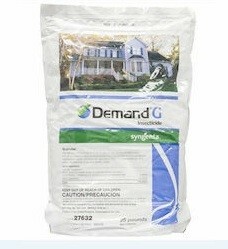 RATE OF APPLICATION: 25 lb bag will cover up to 8,000 sq/ft. Retreat every 30-60 days. It's not possible for us to know for sure the proper setting to use but you should be able to judge based on how you use it for your fertilizer. Just take the amount of fertilizer you apply and the setting you use and that can be a starting point "gauge" of sorts. For example, let's say you generally fertilize the entire acre using 150 lbs of fertilizer. When treating with the Demand, you'll need around 150 lbs so the setting should be near to the same. But if you only use 75 lbs of fertilizer, then you would want to reduce the setting to be about 1/2 of what you normally set it at since you'll need to apply about twice as much Demand as fertilizer. As for using a backpack sprayer for the liquid treatment; you can definitely get away with using one. The key is simple. Be sure to apply enough of the concentrate. In this case, you'll need about 6 oz of the concentrate to get the job done for one acre and I would recommend using it in no less than 20 gallons of water. Ideally you should use 25-40 gallons of water but if you time the treatment right and get it applied just before a rain, the rain will actually help by getting the treatment to penetrate the soil properly. Works well. I ordered these granules after wasting money with a professional exterminator to treat a springtail problem. After the extermination failed I ordered the granules along with Cyonara RTS to thoroughly treat the area and within two days the problem was resolved. I decided to pre-treat this year as a preventive measure.